On November 27, 2018, Sue Sandberg, MBA, RN, CEO of MelroseWakefield Healthcare, including Lawrence Memorial Hospital and MelroseWakefield Hospital, and executive vice president of Wellforce, made a presentation at the Medford City Council meeting. As a follow up to last night’s meeting, please see the full slide presentation here. You’ll see on slide #9 an outline of existing services and the services we would like to bring to the campus. The Community Advisory Group was instrumental in recommending this structure and we hope it helps clarify what services will remain in the existing structure as well as new services that will come with the Ambulatory Surgery Center. Opportunity for abutters and others to come by and ask questions about information shared at the City Council meeting. We have been invited to provide an update to the City Council on our process thus far regarding the proposed ambulatory surgery center. At this time, the results of the traffic and parking study and proposed ambulatory surgery center site location are not yet available, due to the early-on road work delay. These results will be shared at our December 12 meeting. 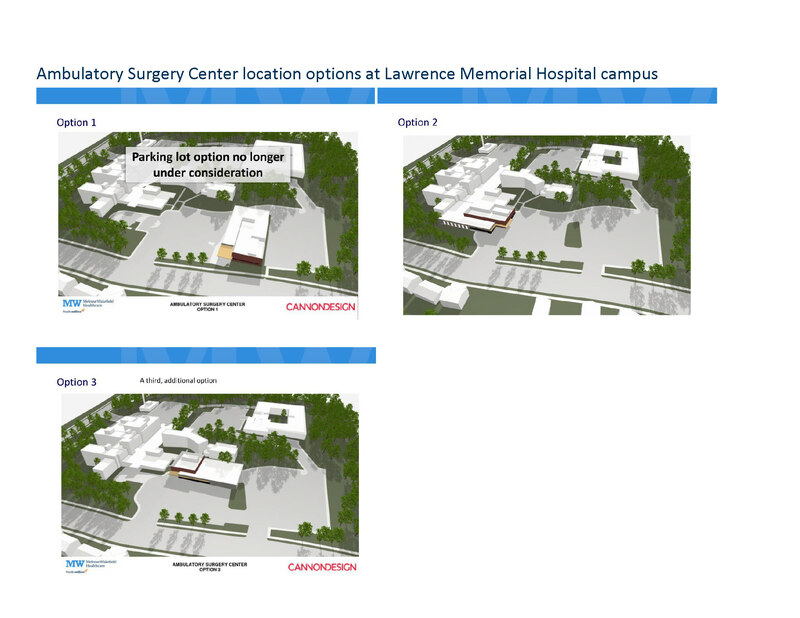 This fall, borings were conducted at the Lawrence Memorial Hospital campus in order to determine if the proposed sites for an ambulatory surgery center had the proper geological underpinning. The borings showed consistent conditions on the campus and confirm that the campus is ok for construction. We are hosting a drop-in meeting for abutters on Thursday, November 15 from 5:30 – 7 p.m. at Lawrence Memorial Hospital in the Johnson Conference Room on the first floor. This is an open-house style opportunity for abutters and neighbors to stop by should anyone have questions about information that has recently been discussed and shared. Members of our leadership team will be available to talk with you and answer your questions. If you’re unable to make it, we are looking to schedule another drop-in meeting after the Thanksgiving holiday. Also, please feel free to continue emailing any questions or comments to our team at community@melrosewakefield.org. The future of emergency services at Lawrence Memorial Hospital has been questioned for some time by employees, staff and the community. Based on the decreasing number of cases we see, and the lower-acuity of those patients, we know there is a growing need for more robust, extended urgent care to better address the community’s needs. Below is some helpful information regarding our plans to transition our emergency medicine services to expanded urgent care at Lawrence Memorial Hospital. The Lawrence Memorial Hospital satellite emergency facility receives less than one patient an hour on average, and less than one patient total, on average, between midnight and 7 a.m. The Lawrence Memorial Hospital satellite emergency facility sees low-acuity patients, most of who can be treated in an urgent care setting with no high-cost emergency room co-pay. Lawrence Memorial Hospital urgent care treats pediatrics to adults. In early 2019, at the time of transition from emergency services, Lawrence Memorial Hospital urgent care will extend its current hours of 9 a.m. to 9 p.m. Monday through Friday, and 9 a.m. to 5 p.m. on weekends to 7 a.m. to 11 p.m., seven days a week, and will be staffed by emergency medicine providers. Urgent Care treats children to adults with cuts (stitches), fractures, sports injuries, playground injuries, injuries from falls, back/knee/joint pain/injury, respiratory illness, flu, strep, earache, fever, skin ailments/rashes, suspected concussion, allergies, eye irritations, minor burns, and more; and can perform x-rays (read by hospital radiologists), lab tests, provide prescriptions, and referrals to specialists. This transition in services is a 120-day process with the Massachusetts Department of Public Health. We will continue to communicate updates throughout the process. We have notified the Mayor’s office and City Councilors of this plan and expect there will be a public hearing sometime after our filing in 30 days. We will be providing more information to the community on the plan at the Medford City Council meeting on Nov. 27, 2018. The members of the Community Advisory Group have been named. The members have diverse experience and interests and will help advise Lawrence Memorial Hospital leadership in ensuring that issues are properly addressed in public forums. This group will provide a seat at the table for community input as the Ambulatory Surgery Center project moves forward. Please continue submitting questions or comments to community@melrosewakefield.org. We will be sharing community responses with the Community Advisory Group to help inform our outreach and messaging as we continue moving through this process. The location of the Ambulatory Surgery Center is of great interest to the community, City and the Medford City Council. As we continue to engage with the community and hear feedback, we understand the least desirable option is the one that puts the new center in the middle of the existing parking lot. We have listened to your comments, so this option is no longer under consideration [See image below]. Complete information on final location with images, parking and traffic analysis will be shared with the entire community at the city-wide community meeting. It was suggested by the City Council that MelroseWakefield Healthcare hold regular “drop-in” meetings at Lawrence Memorial Hospital for abutters and the community to have the opportunity to check-in and/or discuss ongoing questions and concerns. We are in the process of identifying times and locations for these meetings and will promote the scheduled hours widely through this email list, the website, the City’s website, and City-wide calls. Next Community-Wide Meeting December 12, 6 p.m., Medford High School. We are working on having more detailed information about important elements of the Ambulatory Surgery Center plan at our next community-wide meeting, which we are happy to announce, is scheduled for December 12, at 6 p.m. at Medford High School. In addition to announcing this meeting to our email subscribers, we will begin promoting the date, time and location widely through this email list, the website, the City’s website and City-wide calls well in advance.